We found 92 matching items. c. 1814 This is believed to be a caster that was unearthed at one of Niagara's Battlefields. This item is on display at the Battleground Hotel Museum. This is a snuff box believed to be from the Battle of Lundy's Lane which can be found at the Battleground Hotel Museum. Snuff boxes were used to hold powdered tobacco which was often sniffed through the nose by both men and women. c. 1812 A horse shoe unearthed at one of Niagara's Battlefields. This item is on display at the Battleground Hotel Museum. c. 1812 A knife with white handle that was unearthed at one of Niagara's Battlefields. This item is on display at the Battleground Hotel Museum. c.1812 This knife with the handle missing was unearthed at one of Niagara's Battlefields. This item is on display at the Battleground Hotel Museum. c.1812 This cavalry sword with a wooden handle is measured at 13 ¾ inches long. It was said to have been recovered from one of Niagara's Battlefields. This item is on display at the Battleground Hotel Museum. c. 1812 These are various sizes of small cannon shot and musket balls from the Battleground Hotel Museum. c. 1812 These are various pieces of a musket action that were unearthed at one of Niagara's Battlefields. These items are on display at the Battleground Hotel Museum. c. 1812 This is a remnant of the tip of a bayonet sheath which can be found at the Battleground Hotel Museum. This is an oval cross belt plate with no markings on the front and two plugs and a hook on the back. It is believed to from a United States militia during the War of 1812-1814.
c. 1812 This is believed to be a piece of a belt found at the Lundy's Lane Battlefield Site. It is currently on display at the Battleground Hotel Museum. These are British red coat fragments that are believed to have been unearthed at one of Niagara's Battlefields. These items are on display at the Battleground Hotel Museum. c. 1812 This is a United States army Grey coat uniform fragment that is believed to have been unearthed at one of Niagara's Battlefields. This item is on display at the Battleground Hotel Museum. 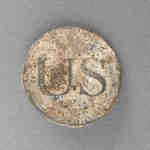 c. 1812 This is a United States Infantry (general service) button. The letters "US" are raised in the center and this metal button measures 2 cm in diameter.This item is on display at the Battleground Hotel Museum. This is a button from the 41st Regiment of Foot that served in the Canada during the War of 1812. The design is a "41" raised in the center of an eight point star. This item can be found at the Battlefield Hotel Museum.